Journalist Gabrielle Glaser has created quite a stir with her April 2015 article in The Atlantic titled “The Irrationality of Alcoholics Anonymous.” In her article, she highlights the lack of science behind 12-step programs. This lack of science is, in part, due to AA’s anonymity principle. The organization does not keep member or case files and conducts no studies on their own success or failure rates. Many commenters on both The Atlantic and on the MSNBC discussion board have taken Ms. Glaser’s article as “bashing” AA and endangering lives. Alcoholics Anonymous does not define itself as a treatment for alcohol use disorder. The organization calls itself an “international fellowship” of people. Yet many doctors, judges, therapists, and members of the general public consider it the number one treatment available. What Ms. Glaser has done with her article is point out the lack of scientific data and provide information about treatment options that do have scientific studies to back their effectiveness. This is far from irresponsible or dangerous–it is commendable. The C Three Foundation has a saying, “Options Save Lives.” For us, that means it’s important to support individuals in making informed choices about recovery options. AA certainly has its place in society and has helped millions of people turn their lives around. But it’s not for everybody. Some people are turned off by the spirituality component of 12-step programs like AA. Others find that a sense of powerlessness increases their desire to drink. The phrases “white knuckling” and “dry drunk” are basic concepts in 12-step, abstinence-based programs. We now know that these states of being are the result of the alcohol deprivation effect, which Glaser talks about in her article. Forcing people to deal with a lifetime of white knuckling when other options for treatment exist is akin to the old practice of bloodletting. Glaser traveled to Finland to talk with Dr. David Sinclair and visit the Contral Clinics. 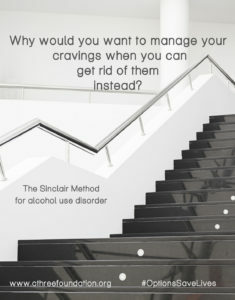 Her presentation of a scientifically sound treatment method, The Sinclair Method (TSM), includes the statistic that in actual treatment and recovery practice it has a 75% long-term success rate. Compare this success to the 90% expected relapse rate for traditional treatments, most of which are based on a 12-step model. Further, TSM is safe, affordable, and can be administered by family physicians without expensive detox and inpatient treatment. As rational individuals, we should always ask if treatments and programs work. This is not “bashing” or trash-talking about programs. It’s the responsible way to make informed decisions for ourselves and our loved ones. We here at the C Three Foundation absolutely love when people ask us for hard scientific proof (because we have it)! But we respect that other treatments, programs, and support groups work for certain people. It’s not the treatments we want to change, it’s the one-size-fits-all culture that elevates 12-step programs as the only valid route to recovery. We want to change the stigma that “alcoholics” are people with moral failings who are spiritually deficient beings who are both powerless to control their drinking yet paradoxically “choosing” alcohol over their loved ones because they “are in denial.” We want to see the death rate from alcohol misuse stop climbing and even decrease. That’s the spirit we see behind Glaser’s article and we support that effort.